Detainees at Suffolk County House of Correction react to an immigrant rights rally. 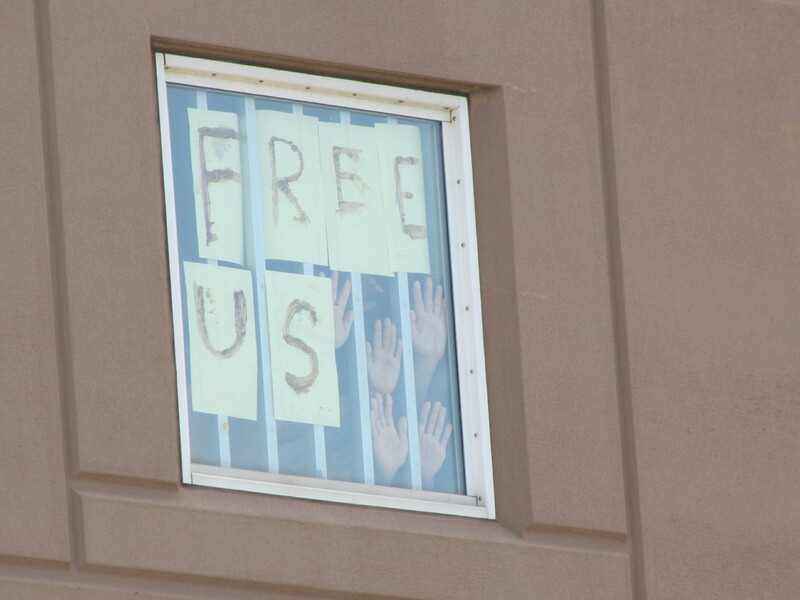 BOSTON– As a new shift of prison workers parked their pick-ups and strode into Suffolk County jail last Sunday afternoon, they walked past a group of activists who prayed for the release of federal immigration detainees locked inside the 11-story jail in Boston’s South Bay. The May 6 prayer vigil, attended by a spirited crowd of about 40 local church-goers and clergy, was organized by the New Boston Sanctuary Movement, an interfaith coalition of religious leaders and lay people who support immigrant rights. “We are here to offer a community of support to the immigrant community and to establish a kind of society where we wouldn’t have this question of documentation and these divisions,” said Peter Lowber, who sits on the group’s steering committee and is a member of Arlington Street Church. Suffolk County House of Correction is one of three state prisons that rents a portion of its beds to the U.S. Immigration and Customs Enforcement Agency. The agency uses the space to hold undocumented immigrants as they await deportation proceedings. ICE has been housing detainees at the Suffolk County House of Correction since July 2003, according to ICE spokesman Ross Feinstein. The agency can hold as many as 235 detainees in the prison, which has 1,892 beds. As of last week, ICE was holding 235 “illegal aliens on administrative immigration violations,” meaning they violated federal immigration laws known as the Immigration and Nationality Act, Feinstein wrote in an email. While he didn’t have specific data for Suffolk jail, Feinstein said nationwide statistics show ICE detainees are held for an average of 26.6 days before being deported. In 2011, ICE deported a total of 396,906 individuals, according to the agency’s removal statistics. Since May 2009, the New Boston Sanctuary Movement has organized prayer vigils on a side-street outside the prison. Lowber said each vigil brings its own surprises, particularly when the group makes contact with prisoners. Sunday’s vigil began with prayer, singing and a somber reading of the names of 123 immigrant prisoners who Lowber said died during detention at U.S. prisons. Then the group marched along a sidewalk and up onto a highway overpass where they faced one of the windowed prison walls. A woman wearing a Guatemalan soccer shirt, who took the megaphone and started chanting “No More Deportations!” in Spanish, said her fiance was locked inside. According to Lowber, occasionally relatives who are undocumented and afraid to enter the prison for visiting hours might catch a glimpse of a loved one through the prison window. The group plans to reassemble for another vigil outside the prison in November.